“My favorite dumpling is a hot dumpling,” my friend Chris observed the other day, after we had each wrapped and devoured dozens of potstickers. My mother would call us to action once the filling was ready, and the table would quickly become littered with rice bowls of water for sealing the dumpling wrappers, thickened and opaque from flour-coated fingers; packets of premade dumpling wrappers, about 30 to the bundle; and, eventually, dinner plates stacked full with finished dumplings, ready for boiling. My sister’s dumplings were flourished, with lovely, neat pleats; my brother’s were sturdy and unadorned…and mine looked like a dumpling representation of my inconsistent, impatient handwriting. Some of my dumplings had extravagant, experimental folds, others featured filling spilling out the sealed sides (a no-no in dumpling-wrapping, if there ever was one), but never, never were my dumplings tidy. A few hours later, we would be done wrapping, and my mother would boil a large pot of water. She and my father would carefully lower in the dumplings with a slotted spoon, wait for the dumplings to come to a boil twice, adding cold water once in the middle to stop the cooking process. Several minutes later we’d be feasting on tender boiled dumplings for dinner, dipped in some combination of soy sauce, vinegar, and hot sauce (for my bowl). 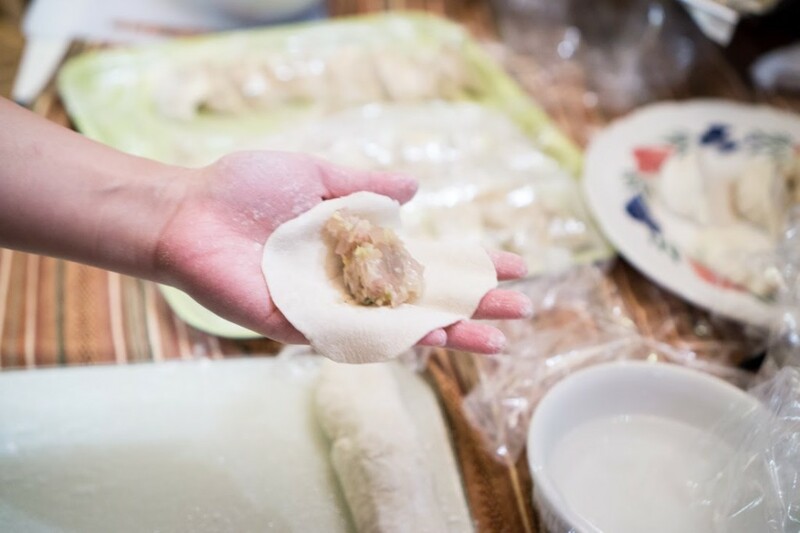 My brother loved the dumpling skins by themselves, so my mother would occasionally take the starchy dumpling water after all the dumplings had been cooked, add any leftover wrappers, and boil the dumpling water quickly for a brothy end-of-dinner treat. Dumplings for dinner, with dumpling wrapper broth for dessert. A tray of beautifully-wrapped dumplings (not by me!) made from packaged dumpling wrappers. Over the years, my siblings moved out and on to college, and then, eventually, so did I. The dumpling dinners decreased in frequency. Then, after a few minor health scares, my parents’ dinners became focused on boiled vegetables. 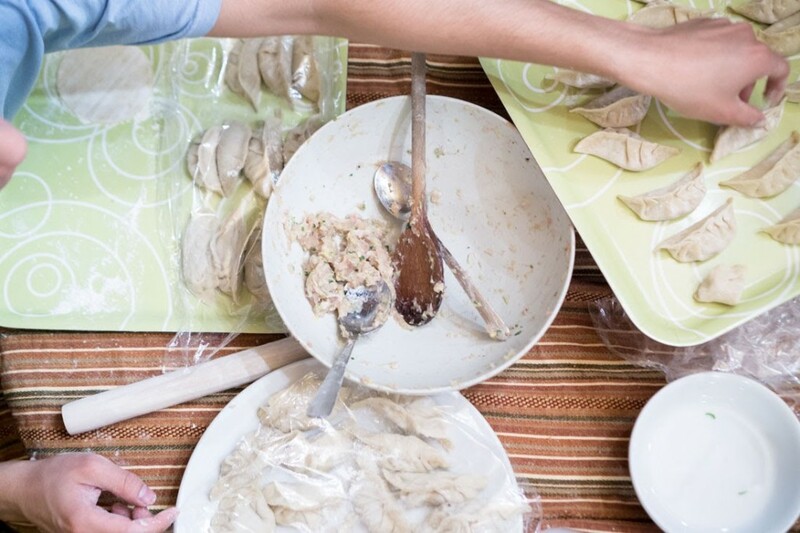 While my parents still occasionally eat boiled dumplings from the freezer section of Chinese or Korean specialty stores, homemade dumplings have become irrelevant to our family meals. In fact, I can’t actually remember the last time my mother gathered us all around for a dumpling-making dinner. 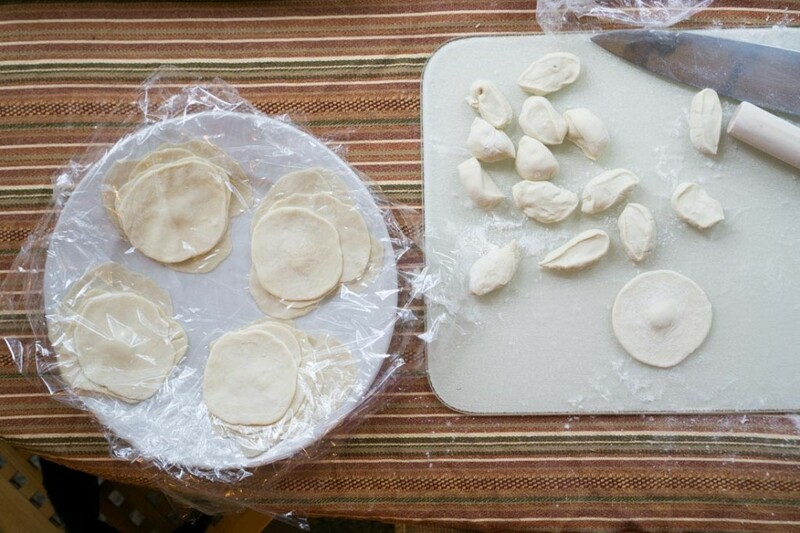 What drew me to revisit the tradition was the possibility of making my own dumpling wrappers. I have a love for chewy noodles that borders on obsession (it’s a Taiwanese obsession, actually–the pursuit of all things super-chewy, or “QQ”), and I always try to hunt down restaurants that serve handmade Chinese or Korean noodles and dumpling wrappers. 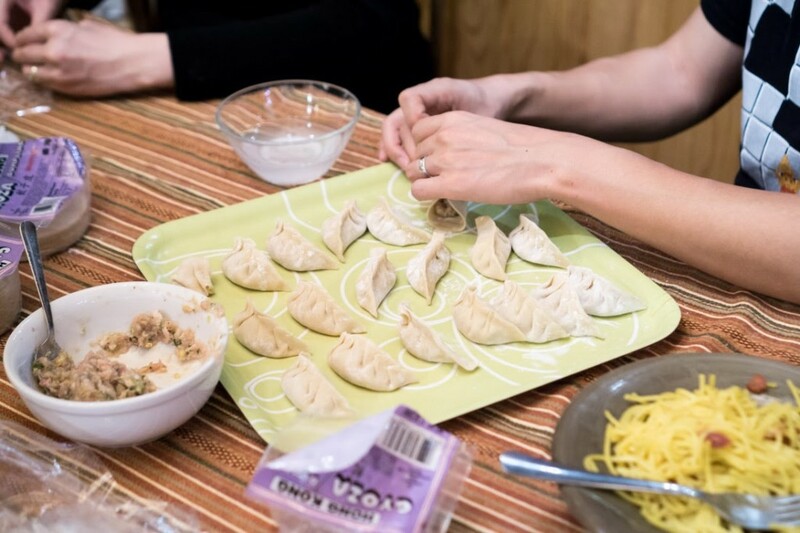 I was intrigued by the idea that the wrappers might not be that difficult to make, and when I found myself planning the meals that I would cook for a recent ski trip with friends, I instantly agreed when my husband suggested a dumpling party. 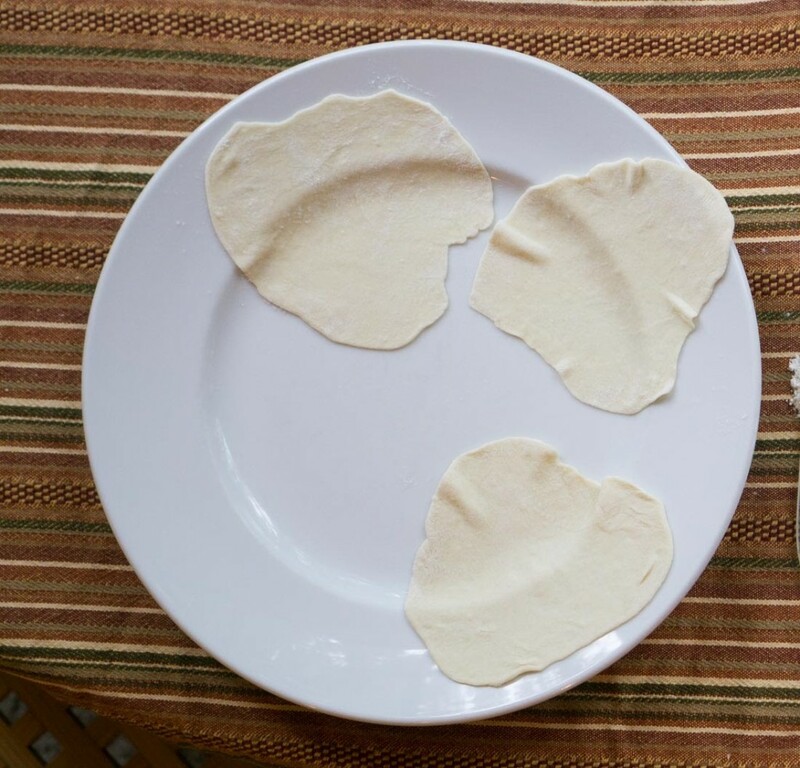 Testing wrapper recipes: cold-water dough on the left, hot-water dough on the right. 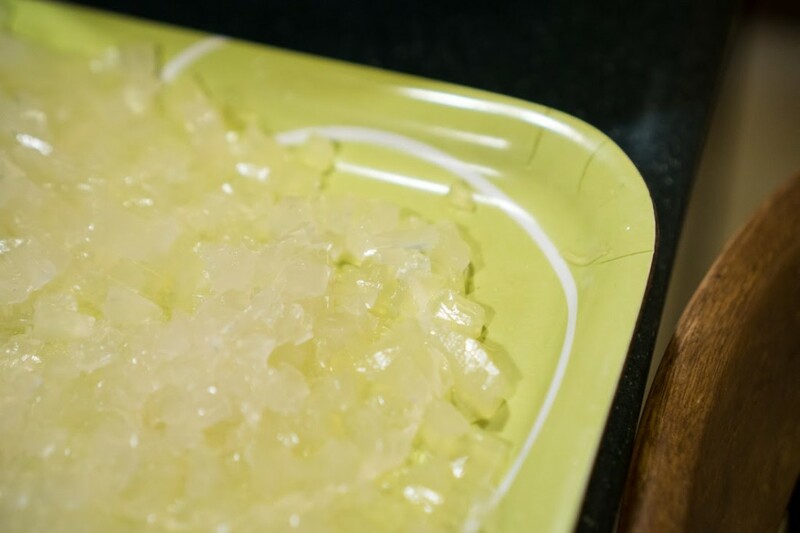 Note the different textures of the dough: the cold-water dough has clumped together in larger chunks and looks more like a stretchy bread dough, while the hot water dough is more crumbly and not nearly as sticky. Cold-water dough: sticky and stretchy with gluten. 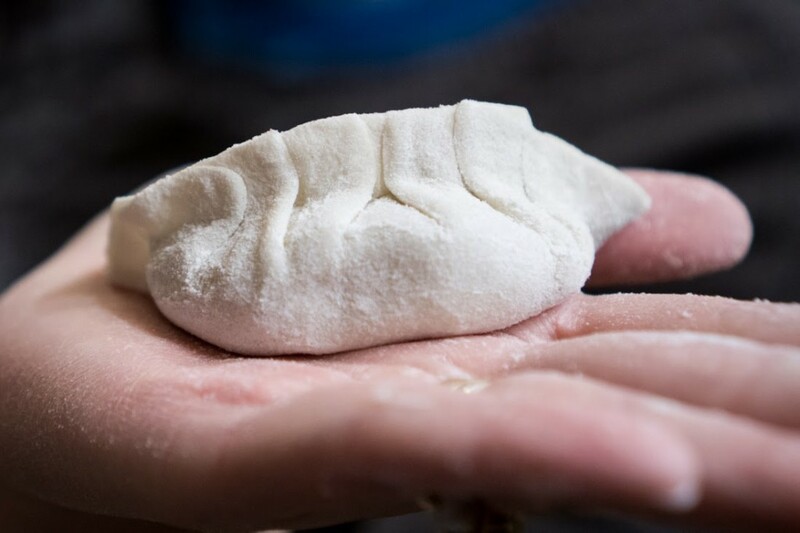 This dough needs a bit more flour to make it workable for dumpling wrappers. 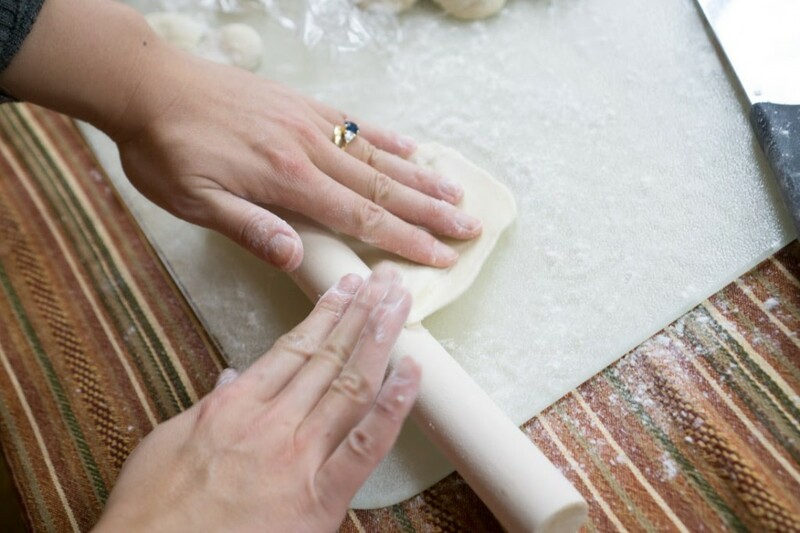 Hot-water dough: this dough resembles play-doh in texture and appearance. It’s silky-soft, pliable, and easy to roll out. I set aside both batches of dough to rest for about 30 minutes while I prepared the filling. Having helped make steamed Taiwanese soup dumplings (xiaolongbao) at my in-laws’ house a week earlier, I became intrigued by the idea of adding cubes of gelatinized broth to the soup dumpling filling in order to create the soupiness inside the hot buns. Although I would be subjecting these boiled, then pan-fried dumplings to much harsher treatment than the delicate steaming involved in making Taiwanese soup dumplings, I thought there would still be a possibility that using a gelatinized broth in the filling could increase juiciness. So, another factor to test. 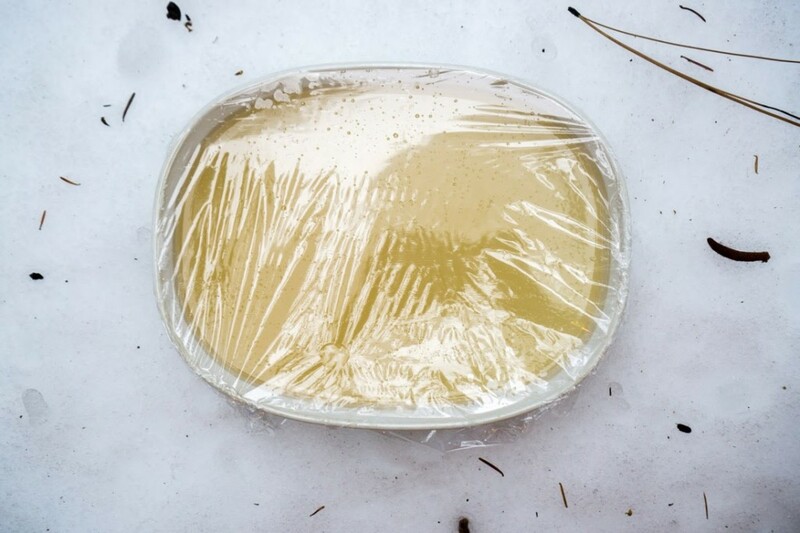 I made a batch of gelatinized broth with boxed chicken broth and a spoonful of agar-agar (a vegetarian substitute for gelatin that’s often used in Asian cooking), and let the broth cool until it was a solid brick of broth Jell-o. 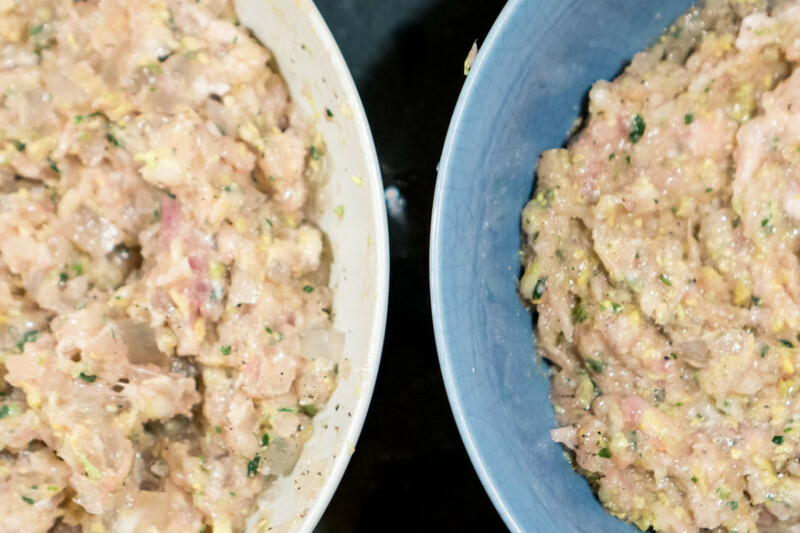 Making the filling: chunks of lean and fat pork mixed with scallions, ready for grinding. While the broth cooled, I turned to the rest of the filling recipe. I tossed some Napa cabbage and salt in the food processor, and let the mixture drain in a sieve. Next, I ground lean pork with pork fat. (Ideally, I would have had fatty ground pork on hand, but having been unable to locate an Asian market close to the cabin that would surely have stocked fatty ground pork, I decided to procure some lean pork, begged the meat counter at my local supermarket to sell me some pork fat trimmings (about 50 cents per pound–so cheap! ), and ground the lean with the fat cuts in my tiny food processor.) 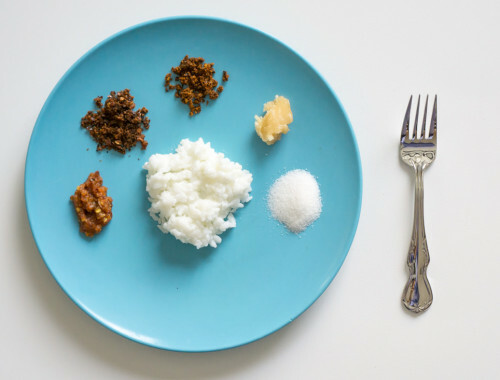 I then mixed the ground pork mixture with the drained Napa cabbage. Because I was testing out the gelatinized broth, I divided my ground pork mixture in half and left one half as is (the “normal” dumpling filling), and mixed the other half with the diced gelatinized broth. Testing both methods of making dough (one with hot water, the other with room-temperature water) yielded dramatically different results. The hot-water dough was indeed very easy to work with–pliable and much less sticky than the room-temperature water dough. 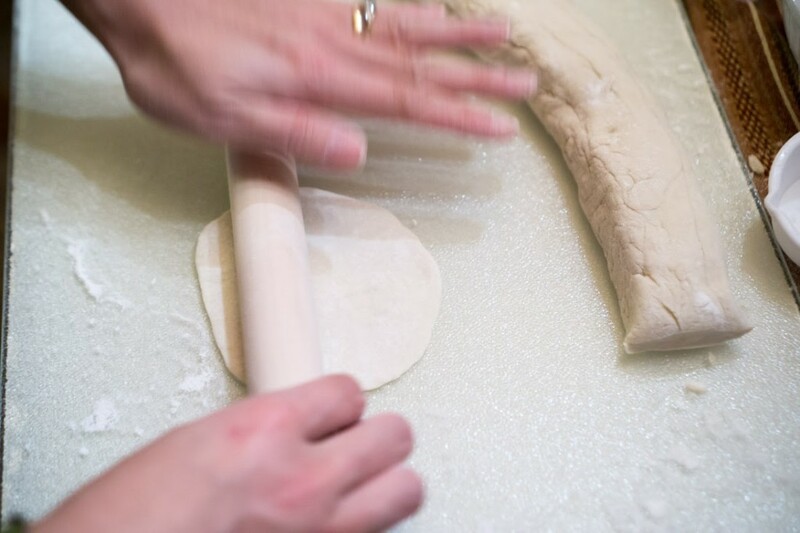 The room-temperature water dough required more resting time throughout the rolling process in order to let the gluten relax, and also necessitated the use of a lot more flour in order to prevent the wrappers from sticking while they were being rolled out, or, for that matter, from sticking to each other. Cut the dough into four even chunks (pictured is the hot-water dough). 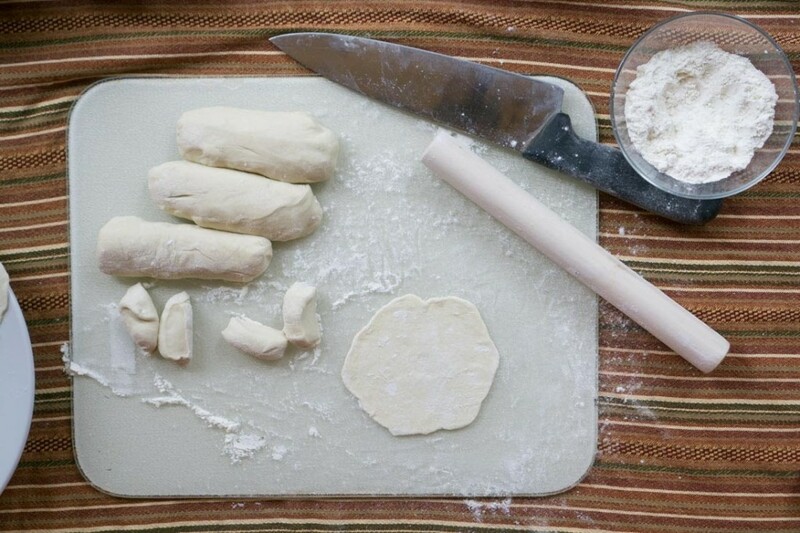 Roll each chunk of dough into a cylinder, and cut each cylinder into eight even pieces. Roll out each piece, trying to keep the edges even and the edges thinner than the middle. My early attempts at rolling out hot-water dough: they look like land masses rather than round dumpling wrappers. …and eventually I was able to roll out decently round dumpling wrappers. Here, I’ve deliberately left the wrappers a little smaller in diameter than my desired final dumpling size, because I anticipate that the wrappers will stretch when I use them. After letting both the hot- and cold-water dumpling wrappers sit under plastic wrap for a couple of hours at room temperature, I discovered an unpleasant development: both types of wrappers had softened to the point that they were sticky and nearly unusable. I quickly gathered up all the cold-water wrappers into a big ball, added about a 1/4 cup more flour, and proceeded to cut and roll out the dough again–this time, aggressively flouring the rolling surface, my rolling pin, the finished wrappers–everything. Voilà: I fought the cold-water dough and I won! After the handmade dough headache, it was time to parboil and pan-fry the dumplings. 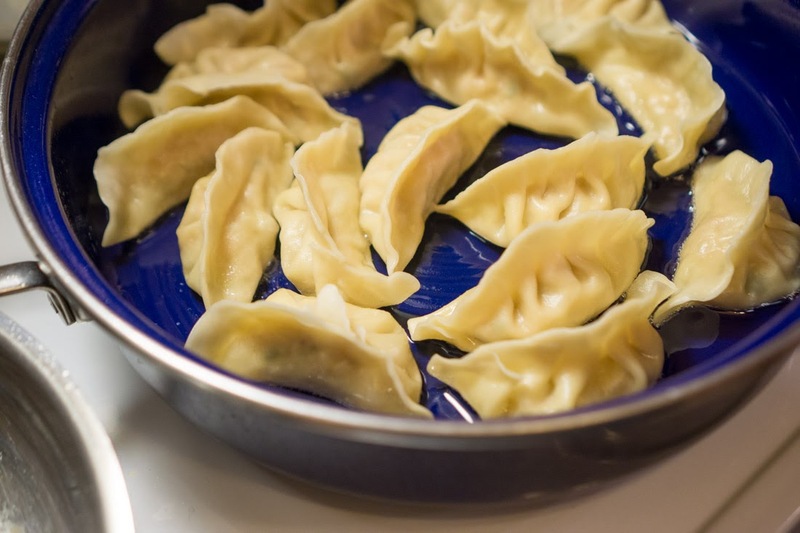 Most recipes call for boiling and frying in the same pan, which has given me unpredictable results in the past (undercooked dumplings or dumplings that stick to the pan, anyone?). 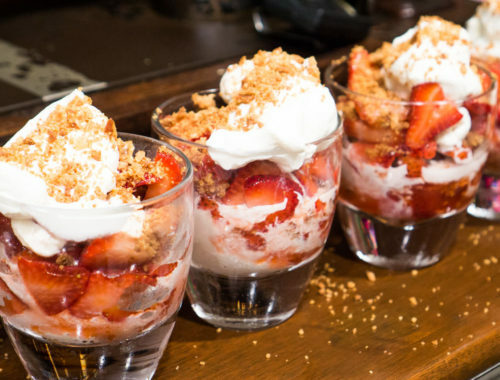 That’s why I love this Serious Eats technique so much. J. Kenji López-Alt calls for boiling the dumplings for about three to four minutes, and then transferring them to finish cooking and acquire a crisp bottom crust in a hot nonstick skillet. It’s a precise method that takes a lot of the guesswork out of potsticker-cooking equation. After boiling and pan-frying all the dumplings, clear differences emerged. The homemade wrappers were definitely thicker and chewier–the al dente QQ quality that I’m always seeking. The cold-water dough wrappers were slightly chewier than the hot-water wrappers–at least, to my taste. The packaged wrappers, while a little boring and predictable in texture, fried up and kept their shape beautifully and were not at all disappointing to eat. Comments: The agar-agar (gelatinized broth) imparted a nice looseness to the filling. VOTE: Derek voted for a favorite combination, rather than separate filling and wrapper preferences: cold-water dough combined with the regular pork filling. His second favorite combination was the gelatinized broth filling with the packaged wrappers. Comments: Chris threw a wrench into the voting by making the astute observation that, all other factors being similar, the temperature (hot) of the dumplings will carry the day. 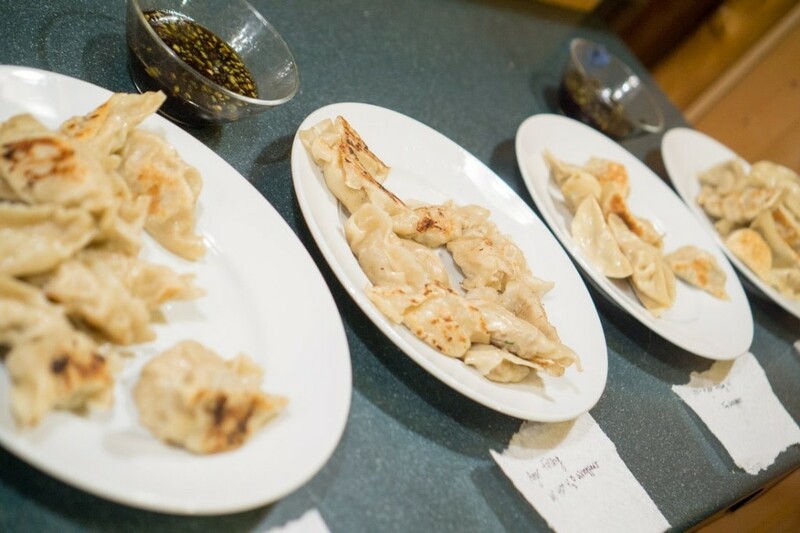 (Because there were multiple batches of dumplings, some were necessarily cold by the time we did the tasting.) Chris’ comment is a good reminder that if you’re pressed for time and you have to choose between serving a hot potsticker made with packaged wrappers or a cold potsticker made with handmade wrappers, you should probably put down the rolling pin and reach for the packaged wrappers. WRAPPER VOTE: Split between the hot-water and cold-water wrappers. Comments: The cold-water wrapper, chewy and gluten-filled, is the dumpling wrapper I’ve been looking for. The final verdict from the attendees at the party was that the cold-water dough created a chewier, more toothsome product, and the gelatinized broth added an additional juiciness to the final product. However, as I quoted my friend Chris in the beginning of this post, the best dumpling is one that is eaten hot. 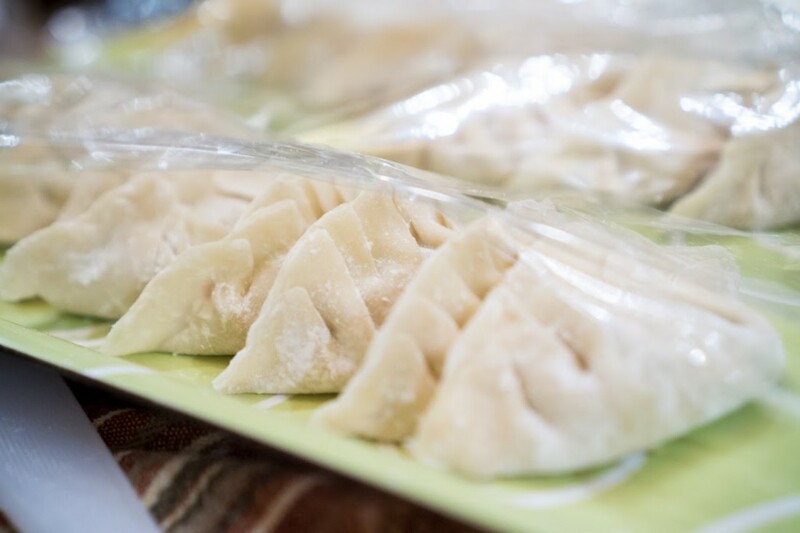 So if you can’t make handmade wrappers, no one will be upset if you use packaged ones–just remember to serve the dumplings hot from the pan, and I promise you that they’ll be devoured swiftly. Bring chicken broth to a boil in a 3-5 quart saucepan. Add the agar agar all at once, sprinkling across the surface of the chicken broth (careful--the chicken broth will foam up), and whisk for 2 minutes until the agar agar is dissolved. Pour broth mixture into a shallow container and set aside to cool for 2 hours or until solid. When solid, dump gelatinized broth onto a cutting board and dice finely. Set aside. Place flour in bowl and create a well in the center. Pour in boiling water and carefully stir until a rough dough forms. Let cool for at least 5 minutes. 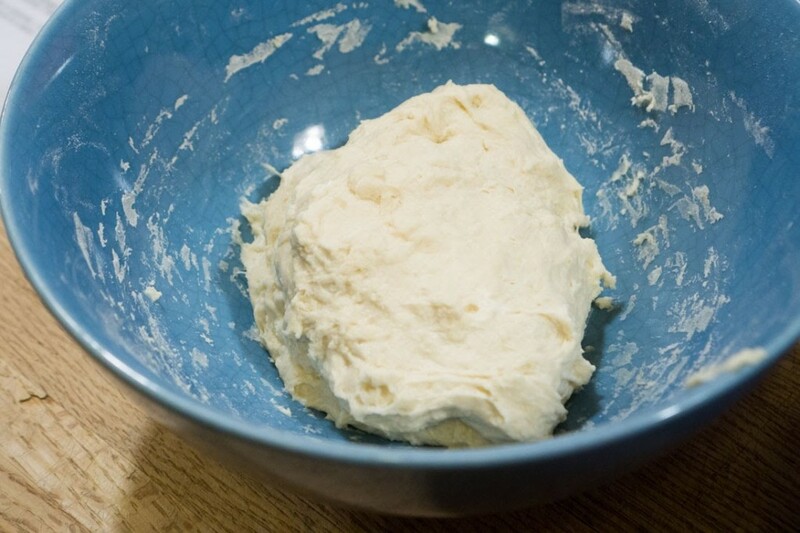 Knead in bowl, adding at least 2 additional tablespoons of flour (and more, as the dough requires) until dough is no longer sticky. 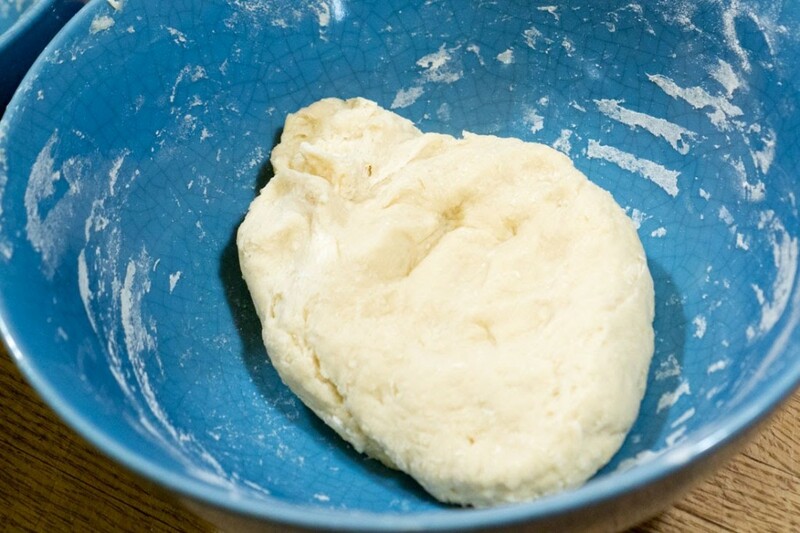 Place dough in clean bowl, cover with plastic wrap, and let rest for at least 30 minutes. Place cabbage and salt in food processor and pulse until finely chopped, about 10 one-second pulses. Transfer to a fine-meshed strainer set over a bowl. Allow to rest for 30 minutes. 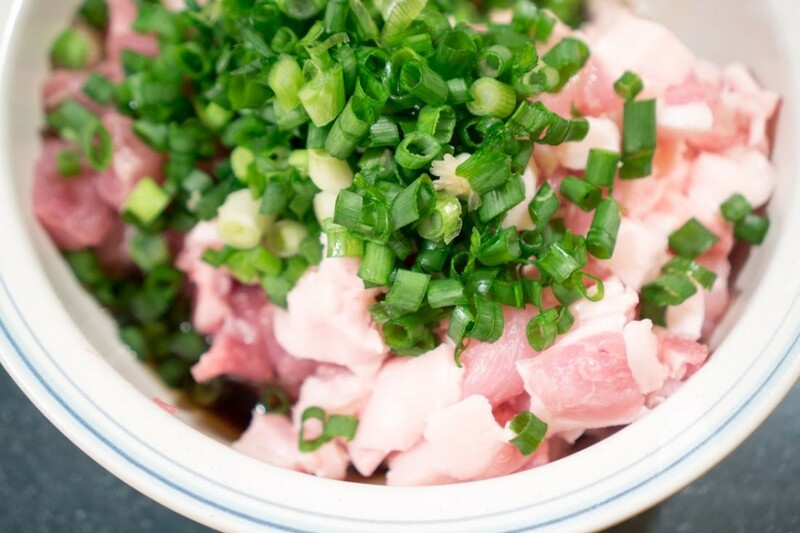 Meanwhile, place scallions, pork, soy sauce, Shaoxing wine, and sugar in bowl of food processor. Pulse until homogeneous and pasty, about 10 one-second pulses. Transfer to a large bowl and stir in diced Gelatinized Broth. Set aside. After cabbage has purged, squeeze any remaining moisture out with your fingers, then transfer to the bowl with the pork. Fold together with a spatula until homogeneous. Microwave a small ball of the filling in a bowl for 10 seconds and eat it to taste for seasoning. Add more salt, soy sauce, or sugar as necessary and repeat tasting/seasoning step until the filling tastes like you want it to. Refrigerate until ready to use. 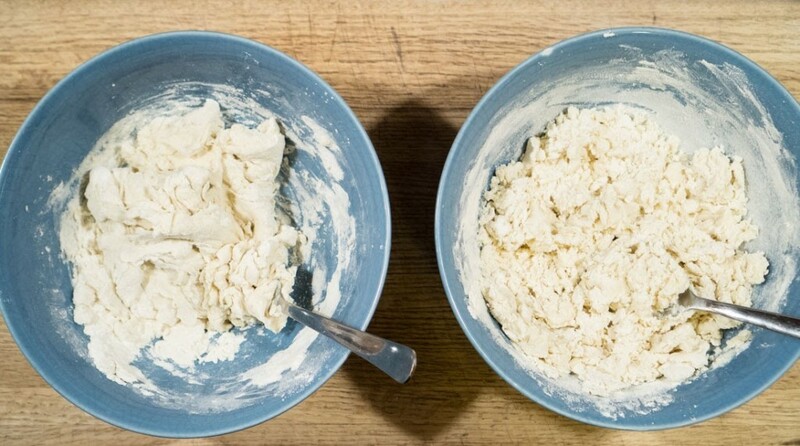 Divide dough into 4 sections, and each section into 8 small tablespoon-sized balls, making 32 balls total. On a well-floured work surface, roll each ball into a round 3 1/2- to 4-inches in diameter. Do not hesitate to add more flour to the dough if it becomes sticky. 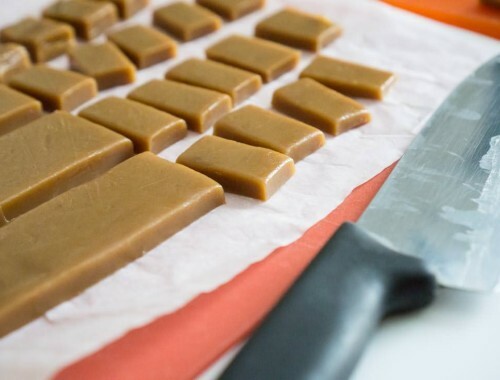 When rolling, try to keep the wrappers thinner on the edges and thicker in the center (otherwise, they will be too thick on the edges after wrapping). The wrappers will be about 1/16-inch thick on the edges, and 1/8-inch thick in the center. Dust front and back of rolled wrapper with more flour. Ideally, you would wrap as you go (a helper to wrap the dumplings would work well here), but alternatively you can stack the wrappers and keep under plastic until all of them are rolled out. 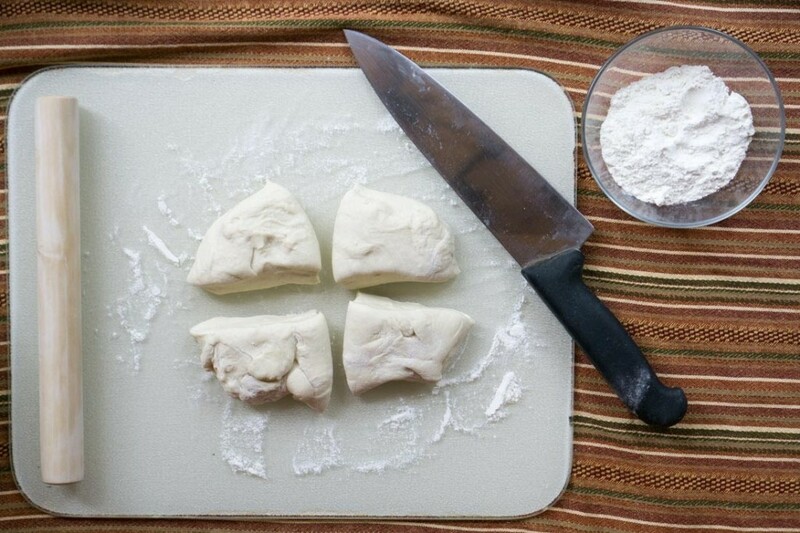 To form dumplings, place 1 tablespoon of filling in the center of a wrapper. Moisten the edges of the wrapper with a wet fingertip. 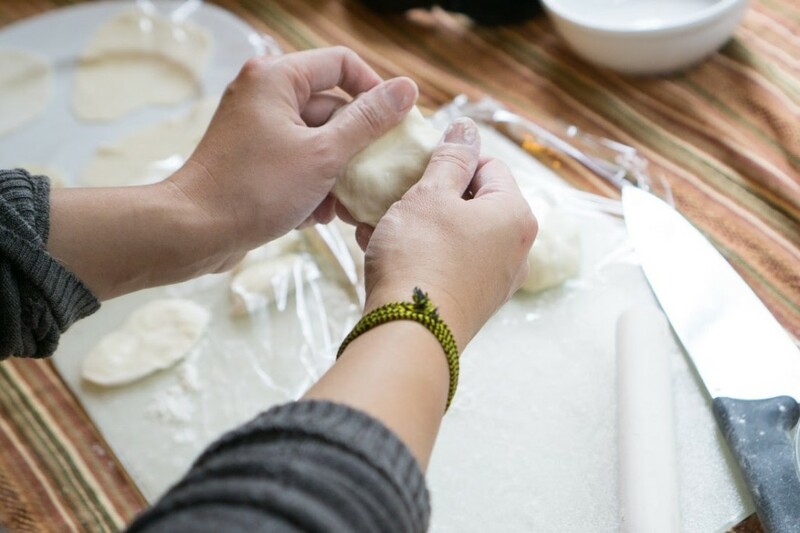 (Wetting the dough may not be necessary if the homemade wrapper is still sticky, but check the strength of your dumpling seams to make absolutely sure that the seams stay closed.) Fold in half and pinch the center seam closed. Pleat the front edge of the wrapper repeatedly, pinching the edge closed after each pleat until the entire dumpling is sealed. Again, make sure you check the seams--the dumpling should be so tightly pinched that it looks almost like you've merged the dough into one. 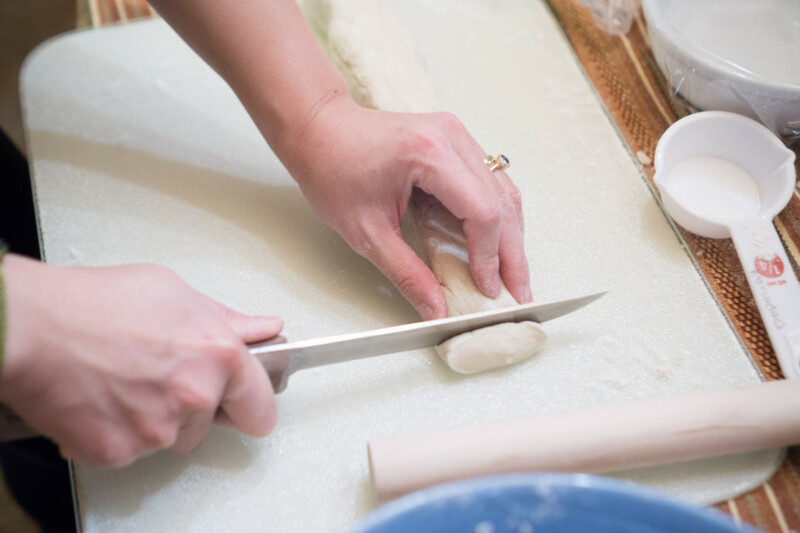 Transfer sealed dumplings to a well-floured wooden or parchment-lined board. Combine all sauce ingredients in a small bowl and set aside at room temperature. Bring a large pot of water to a boil. Add a 6 to 12 dumplings and boil until they float (About 1 minute). Continue boiling for 2 minutes longer, then transfer to a plate with a wire-mesh spider or slotted spoon. Heat 3 tablespoons vegetable oil in a 10-inch nonstick skillet or the bottom of a well-seasoned cast iron wok over medium heat until shimmering. Add dumplings flat-side down and cook, swirling occasionally, until bottom of dumplings are golden brown and crisp. Serve immediately with dipping sauce. Repeat step 7 with remaining dumplings, working in batches.